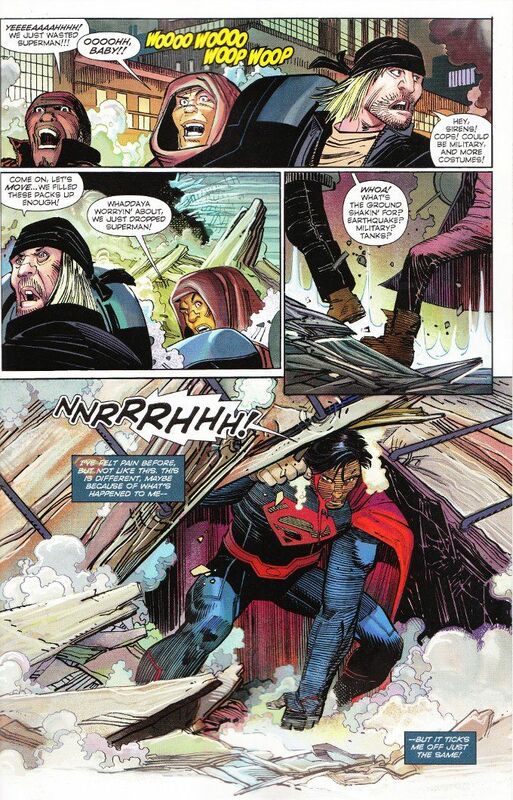 Still recovering from his battle with Ulysses, Superman is in a bit of an odd state. On the one hand, he's discovered a new power that allows him to expel the solar energy in his body with explosive results. On the other, his defenses have never been lower and for the first time in his life he is truly feeling human sensations. It's a bit of an adjustment, but with a little help from his friends, he'll get by. By all rights, I should hate everything about this comic. It's just so goofy and out-of-synch with everything I've seen of The Justice League in The New 52. It features a smiling, wise-cracking Batman, for crying out loud! And yet, I love it. I like having a Batman who threatens to bill Clark Kent for the jet fuel he used flying out to retrieve Clark from a remote location. I like Aquaman jokingly covering Wonder Woman's eyes after Clark accidentally burns off all his clothes experimenting with his new powers. I like the joy that Superman takes in truly being able to eat without the sensations being enhanced to the point where he's overwhelmed by the individual flavors. This book may be goofy but it isn't dull. I'd go so far as to say it's fun. What John Romita Jr. did with this book - as a writer and artist- is remarkable. It's a fun, simple, well-drawn one-shot - something almost as rare in American comics these days as a writer/artist doing most of the work on a single comic for a big-name publisher. I'm anxious to see what Gene Yang will be doing with this series but a part of me will wonder if maybe we should have kept JRJ on to run the show for a bit.